Ufff…. it feels like forever since I started this design but it is finally here! You can find it on Ravelry here. 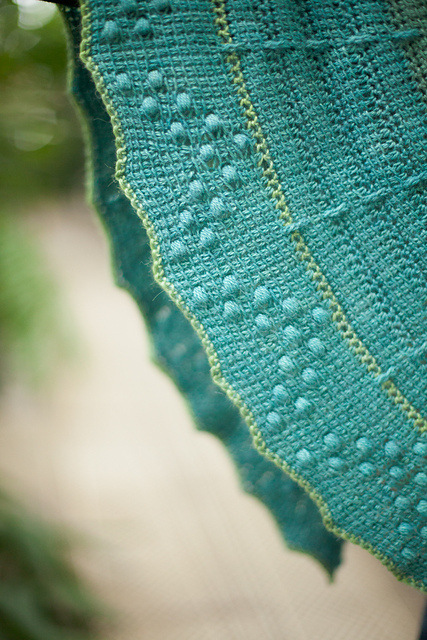 This tunisian crochet shawl is constructed using simple stitches and increases, and you can find a tutorial for all stitches in this space. Below are the pattern details and the tutorials which I think would be useful to check out. 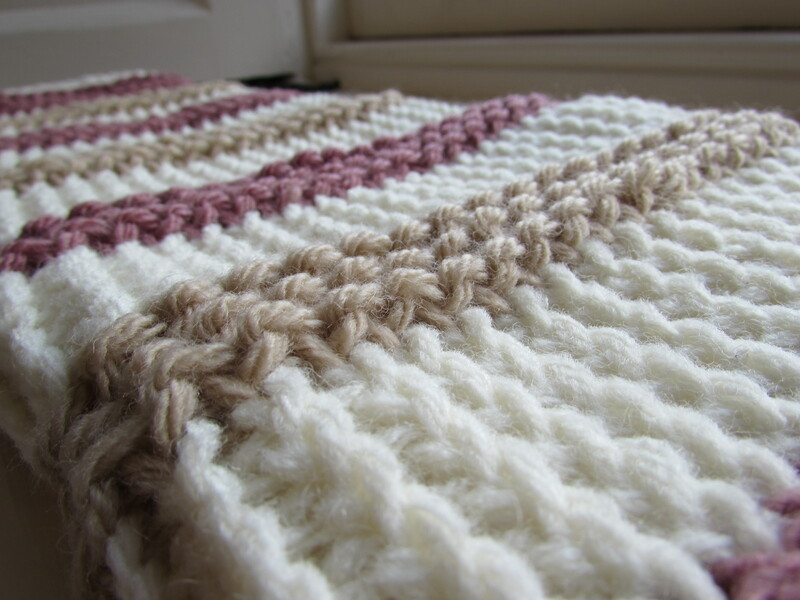 Tunisian crochet – foundation row, forward and return passes, Tunisian knit stitch, Tunisian simple stitch, increases, changing colours and bind off in pattern. Without planning for it, my blog has turned into quite an honest, vulnerable place for me this year. Even though I still share all my yarn and crochet pursuits I am also sharing my feelings, fears and struggles around designing and creating, and I now consider it as a big part of my path towards becoming a braver and more authentic person. For this reason I couldn’t not write this post, no matter how hard it has turned out to explain my reasons. The free vs paid pattern debate has been something that has always been in the background of the designer world, always lurking. Some people believe that more free patterns should be available, some people believe it makes professional designers’ work more difficult and some people believe there is a place for both. I personally consider myself in the latter category: I think free and paid patterns have a different purpose and people are more and more aware of the value of a paid pattern that has been professionally designed and tested versus a free pattern that probably has not. However I must recognise that it has been a long road for designers to get to this point where their work is valued enough for people to be willing to pay a few pounds for it (which is still clearly not enough), so I understand their frustration. 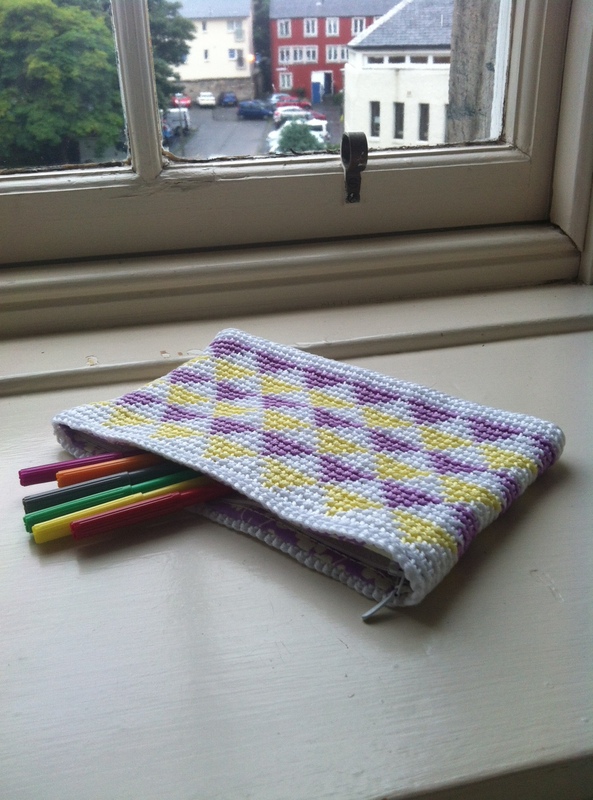 If you follow my blog you will know that so far I have offered all my patterns for free. The main reason for this was time: I did not have the time to get my patterns to a place and quality where I would feel comfortable to sell them. I work a full time job, which means that I can support myself without having to be paid for my “hobby” and therefore I didn’t see the point in investing the time to sell patterns since I really didn’t need the money. Well, here I am, a few months later, with a new design coming up and setting everything up to make it my first paid pattern. It turns out, that investing the time was not only possible, but necessary for me to start getting used to the idea that I may not be who I always thought I was. That I may be more than the girl that always had top grades at every single subject in school but always performed less than average in any art class. The thing is, it has never and it may never be about needing the money for me. I am not saying I am rich and money will never be an issue, I am saying that the value of selling patterns for me is a lot more than the income that comes from them, which let’s face it: it will be very small. It will however, always be about taking myself and my craft (not hobby) seriously. It will always be about challenging and proving to myself that I can do this. That this is not a pastime, a hobby, something on the side that I happen to do, but instead that creating through my designs is a part of me, part of who I am, and my stubborn engineer-you-must-always-be-efficient brain should finally embrace it. We all grow up with an idea of who we should be, who people around us expect us to be. This craft and the path that is taking me is my way to come to terms with who I am and who I want to be, and learning that it is enough. Learning that it is OK to do something even though it makes you lose money, it is OK to be “arty” as well as logical and brainy, it is OK to be myself. It is about one day finally thinking of myself as creative without choking up. So here I go. 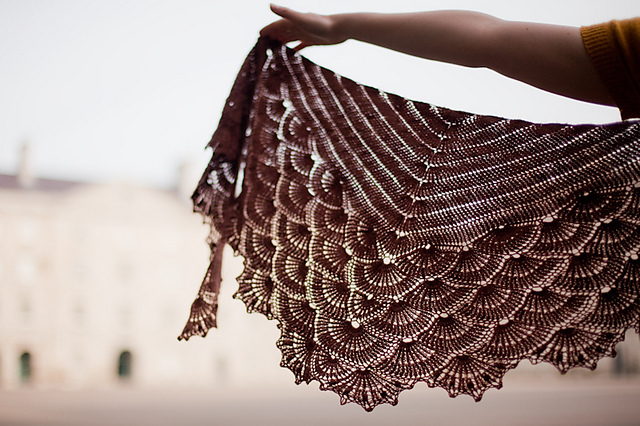 Stay tuned for my upcoming pattern “Ocaso”, a tunisian crochet shawl. It has taken months and months to get to this point, but I couldn’t be more proud to have gotten here. 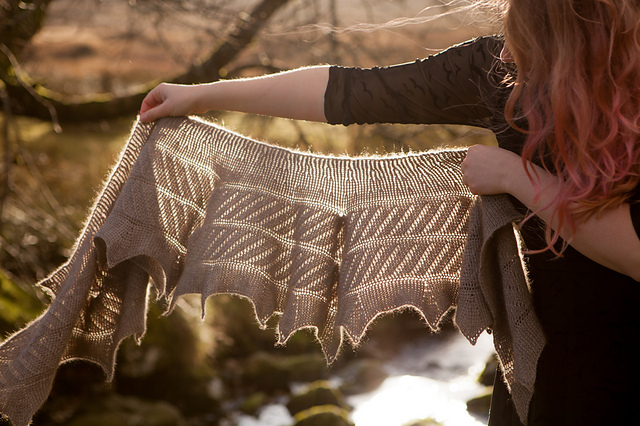 If you have been following the Freyja journey you will know that it has taken a long time to get that first row finished. After many (too many) stitch markers and many hours of sitting down in concentration it is finally done! And I was only off a couple of stitches in the end so nothing that couldn’t be easily fixed (or hidden). By the time you are done with that first row you need to make sure that you ended up with the almost 500 stitches stated in the pattern, which wasn’t easy to count. My advise is to count every 50 stitches and place a marker, that way when you lose your count you just have to begin again from the last marker and not from the beginning. After an easy row of dc the dreaded charts have begun. There are three charts in total and you alternate them through the pattern until you have run out of those 500 stitches. It will make you laugh a bit when I tell you it took me a couple of hours to get through the first 20 stitches…! Only a few hundred to go… I don’t even want to do the math, I just know it will take a while and that is even considering I should go faster once I’ve repeated the charts a few times. 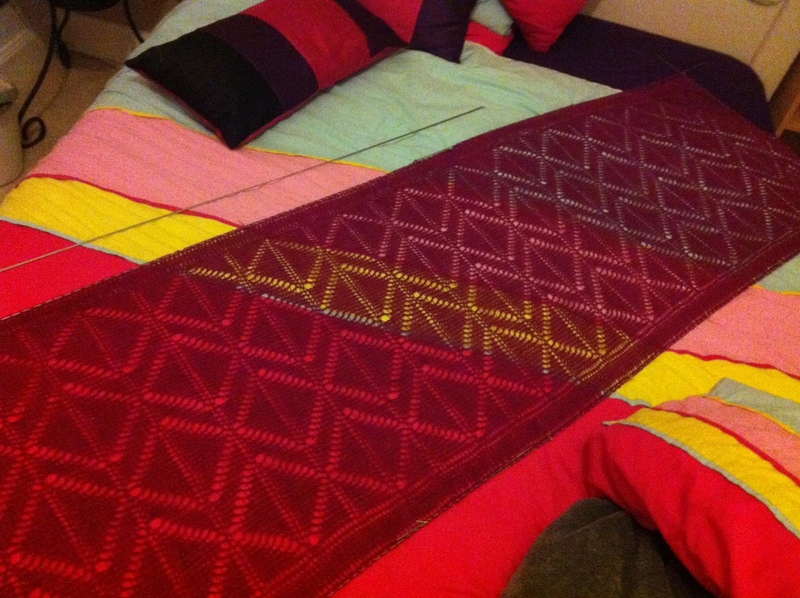 But as I said in my last post, patience is a virtue and this shawl is in no rush at the moment. 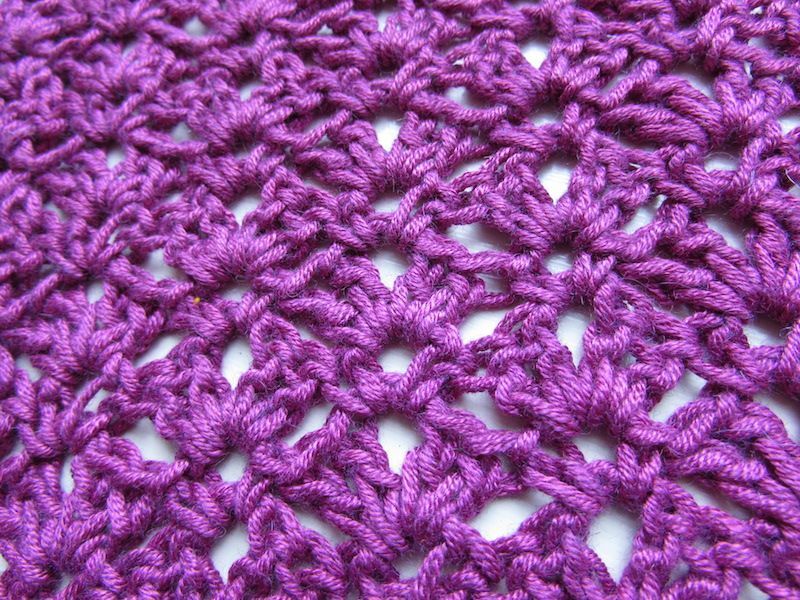 If you know the pattern you may have seen there is a new stitch called “cnupps” which some people are a bit afraid of before starting the pattern. The designer has a really good video explaining everything and I have had no issues with them. I do think that the fabric around the little clusters is not very nice since it has to stretch to give them space, but hopefully once blocked all will be good. In case you are following the pattern, in the first chart there are some numbers on the top and bottom, there is no explanation for them in the pattern but they are only the number of vertical bars before and after the cnupps so that you can keep track of your loops. You can see the results of the first chart in the pictures with the little cnupps coming off the surface, I really like them even if they take a bit of time. Like many other things in life it requires time and gentleness, concentration and precision. This is not an easy pattern but is has been very satisfying indeed, hope I remember this and not only that it took forever to finish! I consider myself to be easily obsessed by a lot of things. My mum has always commented on this and according to her I have always been that way:, if I really liked something I suddenly got obsessed with it and liked only that specific thing until I got bored and found another one. I can think of many examples of this, from books I can’t put down and therefore can’t sleep or eat until they are finished, to food I just can’t stop eating (jammy biscuits at the moment) and many things in between. Some last longer than others and I guess this crochet phase fits into that category, along with my “I can’t live without make-up phase” which lasted a couple of years. Being obsessed with something is different than liking, or loving it. Obsession is when you can’t stop thinking about it, when the longing interferes with your life and basic needs. I have loved many crochet patterns for example, either by first sight or after working through them and just really enjoying the process. Lately however I have found myself obsessed with a pattern I saw on Ravelry and can’t get it off my head! 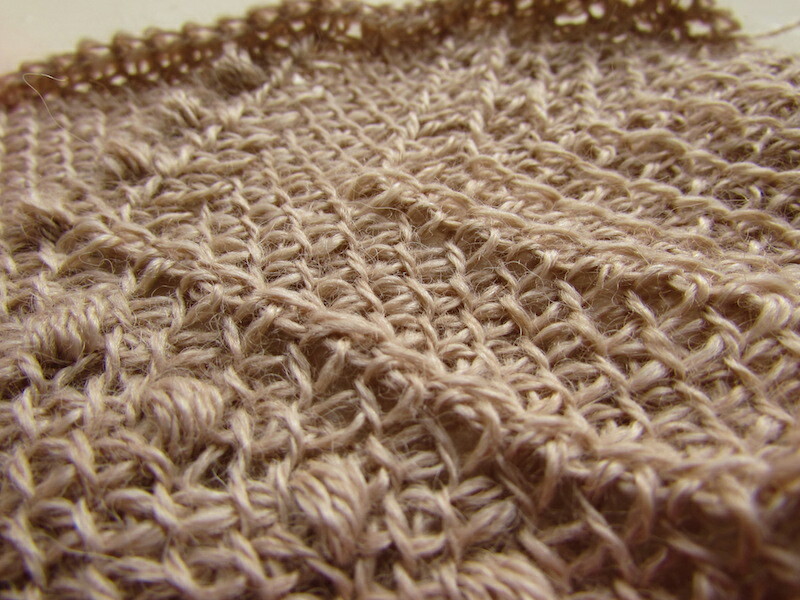 It is a tunisian shawl designed by Patrick Hassel-Zein using some beautifully rustic Icelandic wool. I saw it and I knew it was not love… this was once again an obsession. I need to do this pattern. It’s not that I would like to, I just have to. I know myself by now and I know I won’t let it go until it happens. I have yarn for MANY patterns, including yarn for some designs I have in my head that I would really like to start sampling for but I know it will all probably be delayed a bit. From the moment I realised that the perfect yarn used in the pattern is stocked by one of my LYS I knew what was going to happen. Swatches and I don’t really get along… yet. 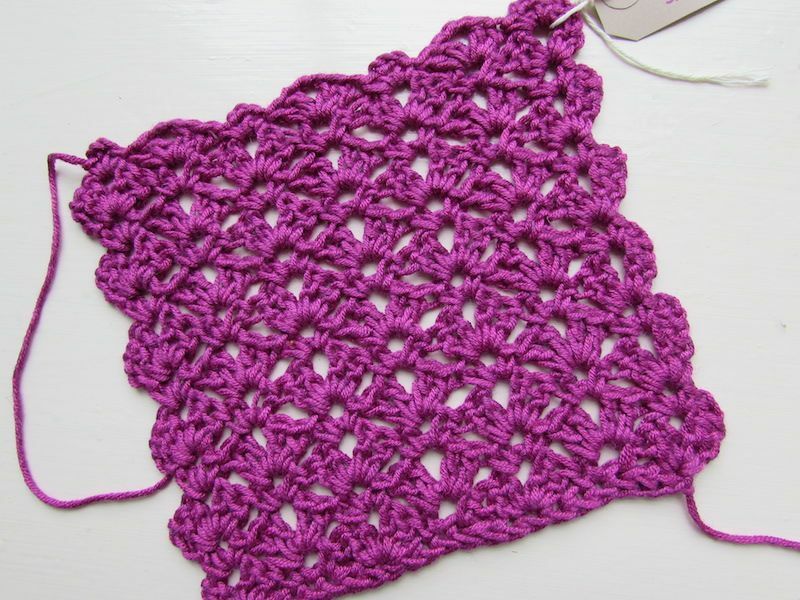 Every designer and experienced crocheter recommends you to swatch if you will be doing a garment and it makes a lot of sense. Even if you are off only one centimetre from the designer’s gauge this can mean a considerable amount once you multiply that to get the length or width of what you will be crocheting. After the experience with my tunisian vest I shouldn’t believe in swatches at all but I know that was not my best effort so I have to give them another chance, I have to do it properly this time. I have started a new crochet garment, this time the Kolika top by Doris Chan. I got this pattern as part of a video class where she explains the basics of top-down construction and gives detailed explanation of how to make this top. I really LOVED this class, I had never worked something top-down but it has quickly become a favourite. Doris Chan is also a great teacher, very clear, encouraging and thorough in her explanations, so if you have never worked this technique before I really recommend it. 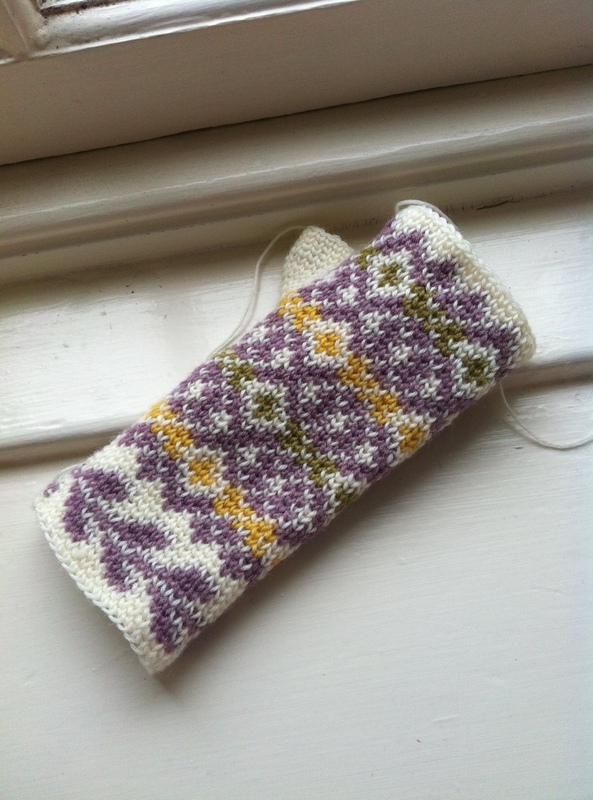 I made a swatch for this, but this time I did it properly. Even though it is quite small I took my time to finish it, I probably picked it up around four times during different days just to reflect how our tension changes all the time. Then I did to it what I will do to the finished garment: I blocked it according to the finishing instructions and measured my gauge before and after. Before blocking my gauge was 0.5″ smaller than the designer’s gauge, but once blocked my gauge was perfect in some rows or 1/8th of 1″ smaller in others. This was very helpful for when I had to choose the size, and keeping a record of my gauge before blocking has helped me track how I am doing as I work the pattern. I am almost finished with the body and even though I can’t tell exactly how it will look once blocked yet (since it will grow quite a bit) I am definitely pleased with the results so far. Gauge swatches are not perfect and the garment may not end up being the exact size that I planned for but after this exercise I am expecting it to be quite close. We will soon find out…! 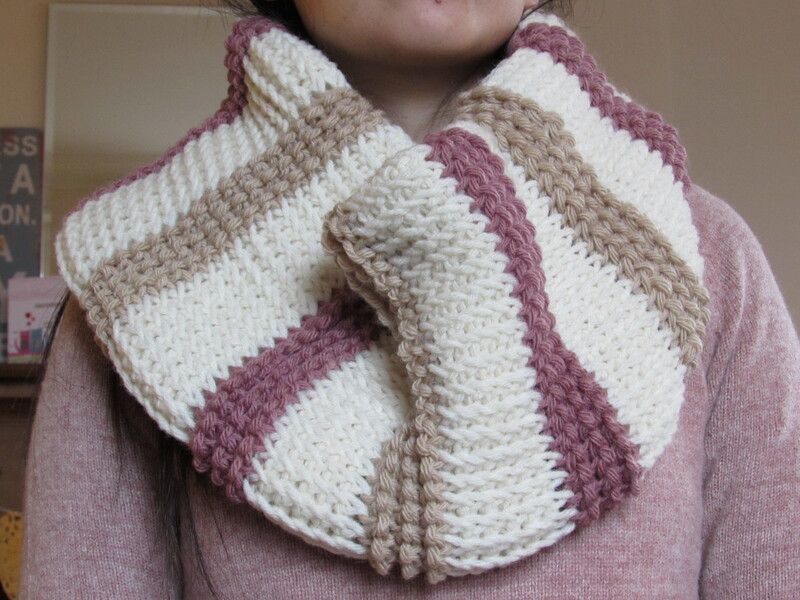 This is my second chunky cowl design of this winter, it is an oversized cowl using vintage colours which goes well with many things in my (and hopefully your) wardrobe. It is quite big, so if you don’t like too much fabric around your neck I would make this less wide and maybe a bit longer. It is up to you! If you are looking for a quick and warm project for this winter then you should give this a try, the yarn is quite affordable, easy to work with and lovely colours available. 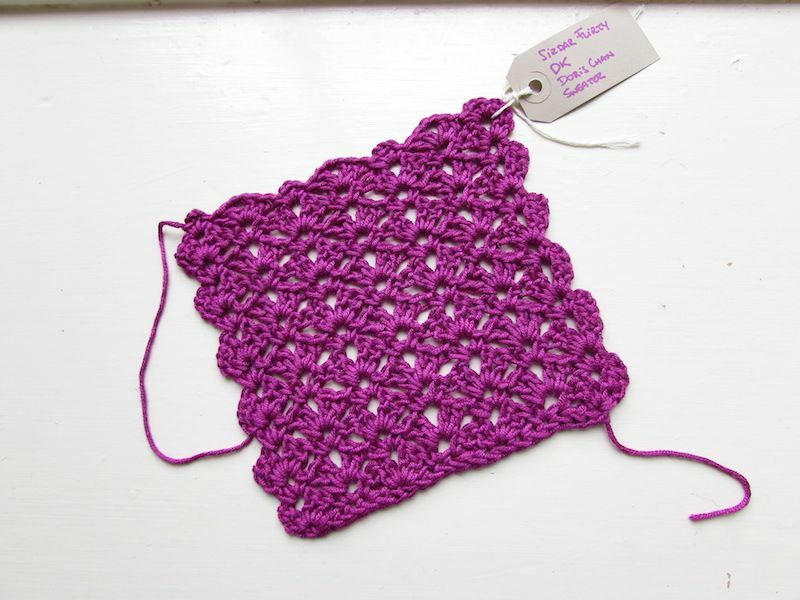 This tunisian crochet pattern is worked flat and then folded and sown to make it double. The inside of the fabric is therefore not shown so there is no need to weave ends since they can be left inside. It uses only two stitches and it works up very quickly. If you don’t know the stitches or how to change colours with tunisian crochet please refer to my tutorials page where you will find everything you need to work this pattern. The two stitches used for the sample in the picture are tunisian reverse simple stitch and tunisian twisted knit stitch, though I will replace this last one in the following pattern for the normal tunisian knit stitch since I don’t have a tutorial for the twisted version. If you like the look of the twisted knit stitch please give it a try, it is a bit slower to work but it looks very nice, there are several tutorials online you can search for. The cowl measures 40cm wide and 85cm long when flat (before sewing) but you should make it as wide and long as you prefer, it is quite big as you can see in the picture. My gauge for this yarn is 10sts and 10 rows in the stitch pattern in 4inx4in, however gauge is not essential since you can just adjust the amount of stitches to get the width you want for the yarn you wish to use. Needle to sew ends together if you prefer this instead of slip stitching. Foundation Row – Forward Pass: Chain number of stitches needed. Skip first chain, insert hook under back strand of next chain, yarn over and pull up a loop. Repeat until last chain. Return Pass: Yarn over pull through one loop on hook, (yarn over and pull through two loops on hook) until you have one loop left on hook. Last stitch of any forward pass (End st): Insert hook under last vertical bar and strand behind it, yarn over and pull up a loop. Tunisian Knit Stitch (Tks): Skip first st, insert hook between front and back vertical bars, yarn over and pull up a loop. Continue this way until last stitch, work last stitch normally. Work return pass normally. Tunisian Reverse Simple Stitch (Trss): Skip first st, insert hook from right to left under back vertical bar, yarn over and pull up a loop. Work last stitch normally. Work return pass normally. To change colours at the start of next forward pass: work previous return pass normally until you have two loops left on your hook. 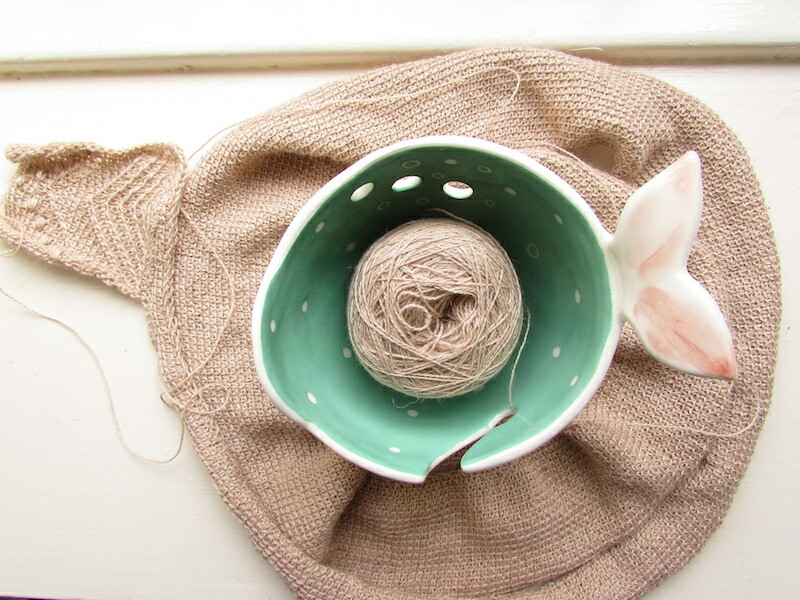 Drop old colour and pick up new colour, yarn over and pull through two loops on hook. Slip st as in Tks: Insert hook between front and back vertical bars, pull through two loops on hook. Slip st End st: Insert hook under last vertical bar and strand behind it, yarn over and pull through both loops on hook. With A ch 40. Work foundation forward pass, you should have 40 sts, each loop in the hook counts as a st. Work return pass. Row 1: Skip first vertical bar, Tks in next st and each st across until last st, work End st. Work return pass. Row 2 – 6: Repeat Row 1. Row 7: Skip first vertical bar, Tks in next st and each st across until last st, work End st. Work return pass, change to B at the end of return pass. No need to cut yarns, you can carry it along on the back. Row 8: Skip first vertical bar, Trss in next st and each st across until last st, work End st. Work return pass. Row 9: Repeat Row 8. Row 10: Skip first vertical bar, Trss in next st and each st across until last st, work End st. Work return pass, change to A at the end of return pass. No need to cut yarns, you can carry it along on the back. Rows 10 to 100: Repeat Rows 1 to 10 alternating colours B and C.
Row 101: Skip first vertical bar, slip st as in Tks in next st and each st across until last st, slip st End st. Fold the fabric lengthways so that the wrong side of the fabric is facing you and sew in the long edge to make a tube. You can use slip st or any other joining method you like. Turn the fabric over so that the right side is facing (make sure all the ends remain inside the tube) and close the tube to turn it into a cowl by sewing both edges together. You will be sewing one circumference against another so that you end up with something like a donut (I am not sure I am making any sense so please ask if you are totally lost!). Don’t sew the four layers together or you won’t be able to hide the seams on the inside of the cowl when you are wearing it. Hello world! Hope you are all doing great and that weather where you are is nice and warm, very rainy in my part of the world today… Despite the weather, my very busy and difficult job, my very limited time for crocheting (or anything that is not working for that matter) and my tendency to get very low at times, I have to say I am feeling very happy today. I am very grateful for my life and those around me, even those that are far still fill my heart with joy and make me realise how lucky I am. Sorry for the cheesy intro but I thought I could share my joy with the world! Since I didn’t want to leave you without a post this week I thought I would continue to share some of my inspiration and favourite designers with you. This time I would like to introduce you to the amazing Aoibhe Ni. If you like tunisian crochet you will fall in love with this designer. Her patterns definitely fall into the “I can’t believe that is crochet” category and her technique is very unique. 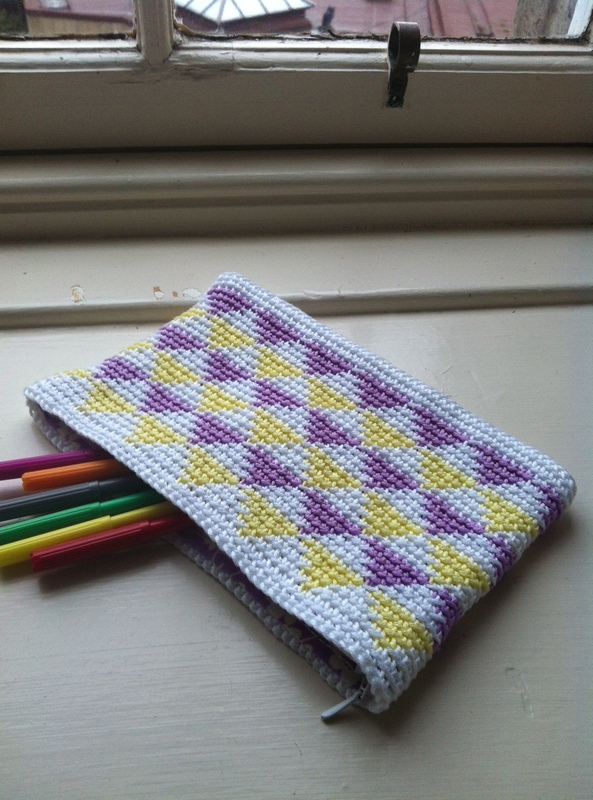 She uses the tunisian crochet technique in a way that you can do it with a regular hook so that you don’t have to buy a special one just for her patterns. This is so smart, thoughtful and budget friendly that I couldn’t believe it was true. And not only that, she uses tunisian stitches in a way I had never seen before. With her designs you will learn tunisian crochet is more than simple stitch for cushions or scarves, oh, it is so much more! Her shawls in particular are STUNNING. I love that she uses lighter yarns and takes away that heavy feel that crochet is sometimes known for. Her designs are delicate, intricate and use lovely colours. Her yarn choice is usually expensive, but you can always substitute for something cheaper. I have tried a few of her patterns and have loved them, sorry I don’t have more pictures but they were gifts so I don’t have them anymore. The only thing you need to be aware of is that since this is a different technique for tunisian it may take some time to get used to it. Her patterns are difficult to understand at first and she uses mostly charts instead of written instructions. The first time I followed one of her patterns it felt like Chinese, but then the second and third were a breeze. She has a free pattern called Pax, I found it more difficult than the other two I tried and would recommend to buy Phoenix instead as a first try if you can. If not, then some people have done some beautiful projects with Pax so please give it a try. 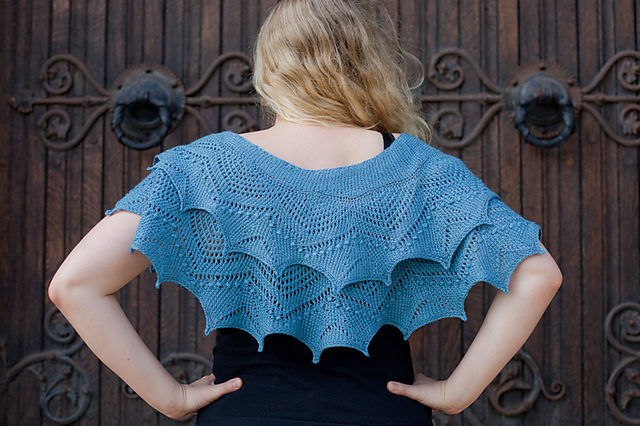 I am constantly in awe by how hook and yarn can give such a wide array of results and this designer is really stretching the boundaries. I am very thankful to such people and hope that you will be too. Stay tuned for the tutorial! Hello everyone! Hope you had a great week. I mentioned in my last post I started a new job and it has taken over my life recently, as with any big change I am trying to juggle things around and unfortunately crochet time has been reduced. This means that patterns may not come as often, but they will come! I will continue to post crochet goodness and share my projects and patterns with you and I hope you stick with me during this transition process. I want to share more of my inspiration, patterns and yarns that are catching my eye so expect some of that soon. In the meantime I thought I would update you on that thumb problem of mine… and tell you that I got it! 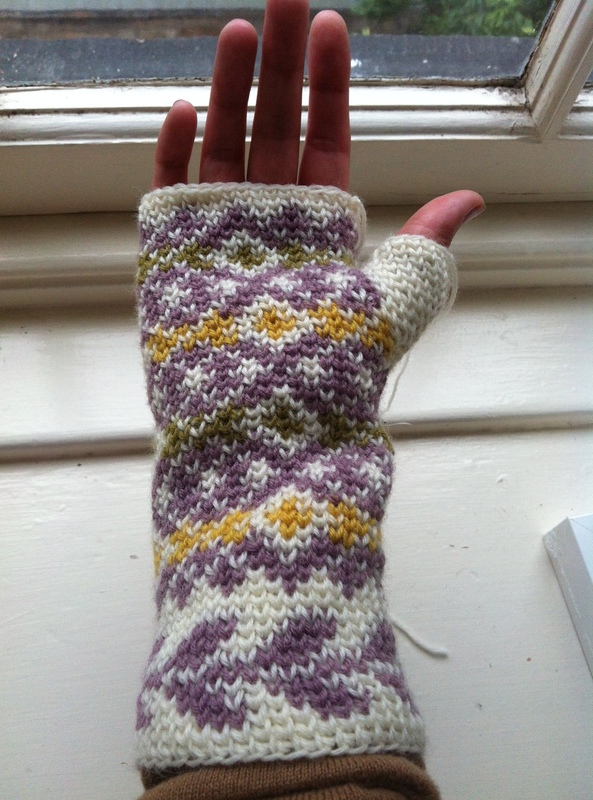 The first fingerless mitten is done and the thumb has been mastered at last. I am so happy with this pattern and want to share it with you guys as soon as possible but first I need to get the other one done so that I can take some more pictures for you. 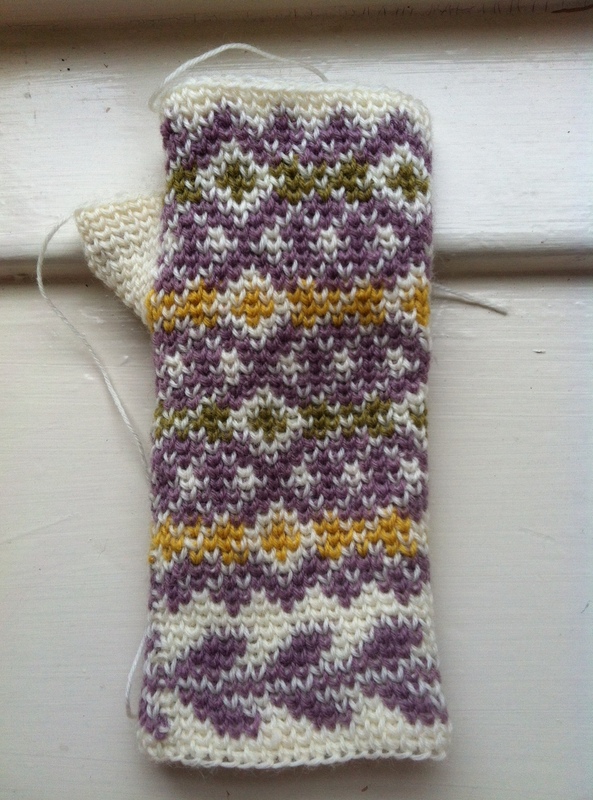 This way of doing fair isle is my favourite I have to admit, it takes longer but the patterns are clear and they don’t distort. I think this pattern will be a milestone in my crochet journey and I am so happy with the discoveries and new places this process has taken me. I already feel more confident when approaching a pattern idea and I think the knots in me are loosening bit by bit. I think I can even see colours a bit more clearly! 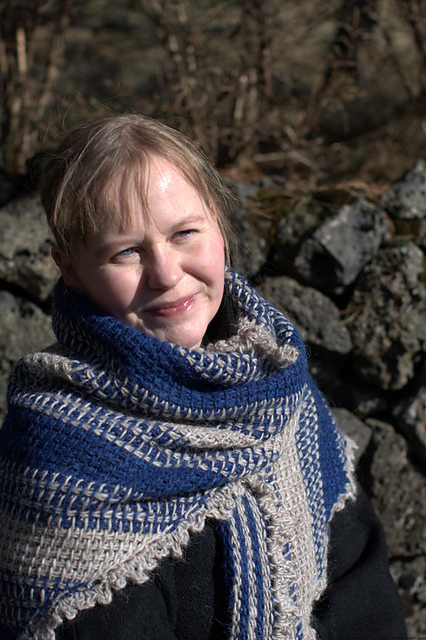 And a big part of this nice and happy feeling inside me is because of all of you: visiting my blog, liking my patterns on Ravelry, pinning them on Pinterest or leaving a nice comment. So I just want to say a big THANK YOU for being a part of my crochet journey and cheering me up all the way. Means the world! Happy Friday everyone! It has been a very busy week for me, I started a new job and it has brought many challenges and has occupied most of my time so I hadn’t had the chance to share the second version of my last pattern with you. 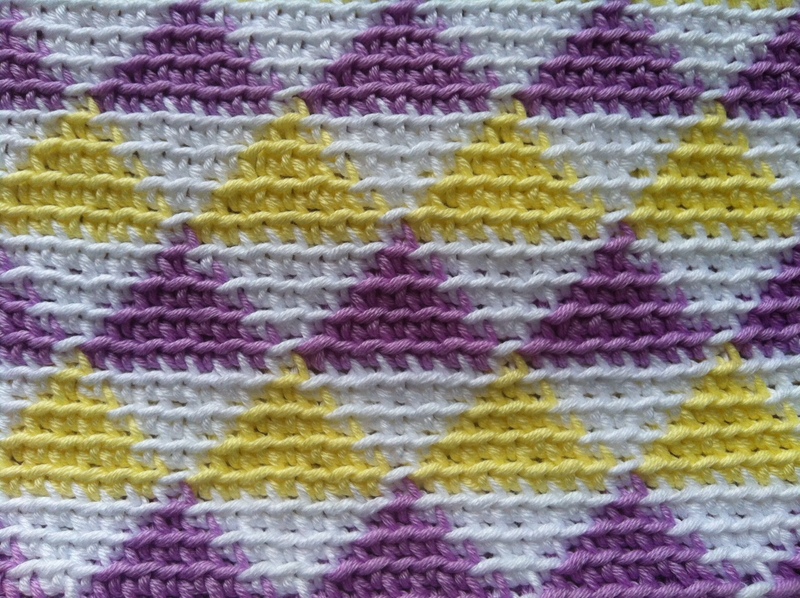 My Happy Triangles pattern published recently used UK double crochet and a 3mm hook for a DK weight yarn, which gave a very tight and dense result. I wanted to share with you the version of this pattern using UK double crochet in the back loop only (BLO) and a slightly bigger hook. So the first obvious result with this changes is that you get a bigger purse for the same number of stitches: 22.5cm long instead of 20cm. I made this purse a bit shorter to get a more rectangular shape, so with 6 rows of triangles you get a 22.5cmx14cm purse. Secondly, the BLO makes the triangles look straight and since the colours are not contrasting they look sharp as well. The seam technique I mentioned in the pattern works great with BLO so you get a very straight seam, in the original pattern it twists up a bit so that it shows on one side of the purse. It doesn’t bother me but if you prefer a straight seam then BLO is the option. Finally, using BLO gives a different texture to the fabric than the one you get doing the stitch normally, you get ribbed rows that I believe look quite nice. 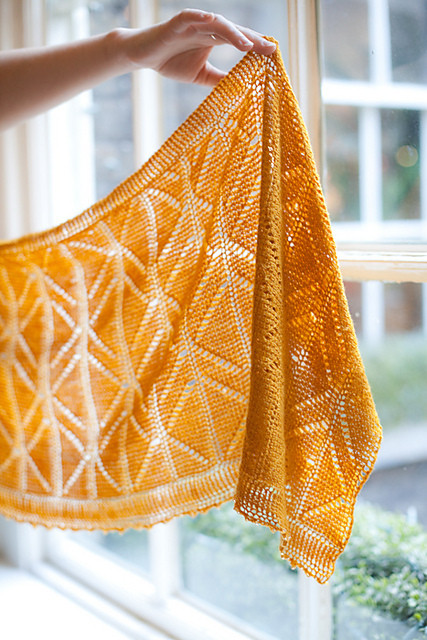 So if you prefer this version of the Happy Triangles pattern, here are the instructions! I made a slight change to the base so that the seam runs along the side and doesn’t show. 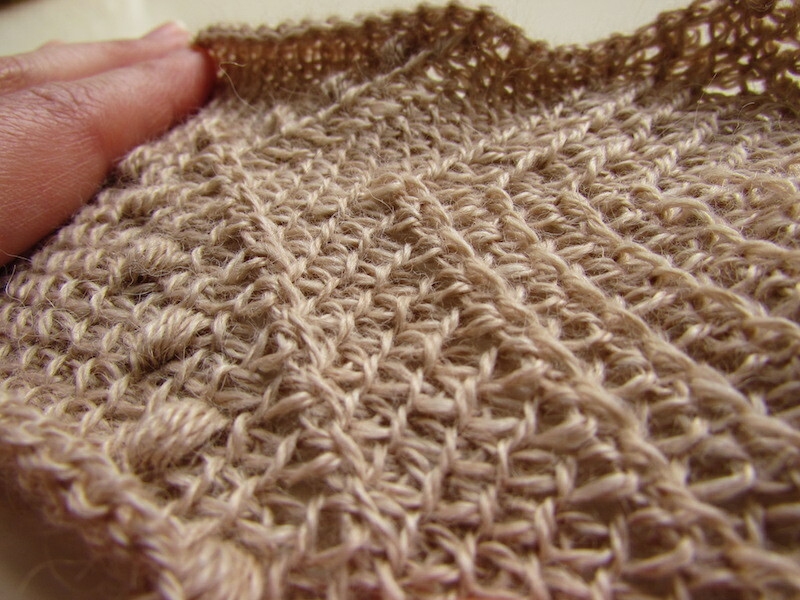 Base: With white yarn Ch 50, 2htr in 3rd ch from hook, htr in each st across until last ch, 6 tr in last ch. Turn to work on other side of ch, htr in next ch and each ch across until last ch, 4htr in last ch, sl st to first htr (104 st). Don’t turn. *Remember to pull tight on the sl st and the ch 1 when starting a new round to keep the seam straight. Round 1: Ch 1, dc in BLO in each st across until the end, sl st to first dc (104 st). Don’t turn. Round 2: Ch 1, dc in BLO in next st and each st across until the end, sl st to first dc. Don’t turn. Round 3-26: Follow chart below, from bottom-up and from right to left. 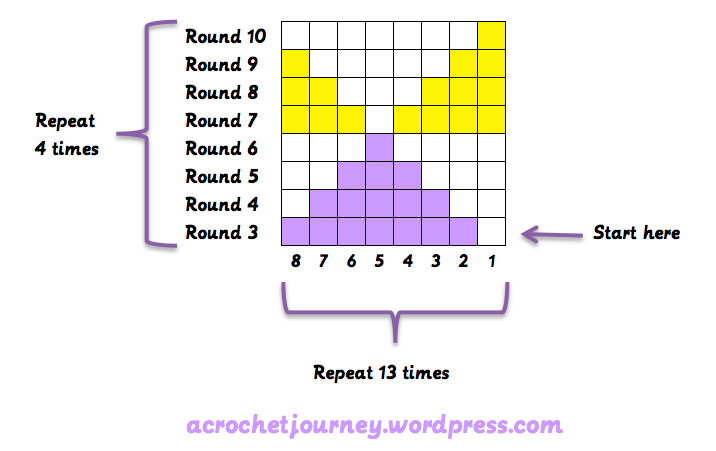 Each round has 104 st (each square is a st) so you need to repeat the 8 stitches in the chart 13 times for each round (13×8=104). Remember to continue working each dc in the BLO. Repeat the chart until you have 34 rounds in total so that you have 6 rows of triangles, 3 of each colour. You don’t have to cut the colours if you don’t want to, all the ends will be hidden once you do the lining. For the lining I used the same post by Futuregirl, tuck in all the ends between the lining and the purse, no need to weave them in! As usual, please let me know if you have any questions.